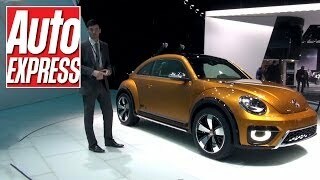 With its first concept getting released in 2000, Volkswagen Beetle Dune Concept 2014 is another addition is the glorifying pages of Volkswagen. Released at 2014 Detroit Auto Show this new concept looks to have increased ride height, new cool looks and oversized alloy wheels. 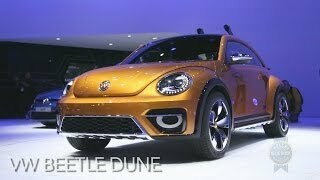 This isn’t the end of list, let us have a close go through at the review of Volkswagen Beetle Dune Concept 2014 and get to know more about the new model in Beetle Line-up. Interior of Volkswagen Beetle Dune Concept 2014 is impeccable amalgamation of ‘Arizona’ orange with black elements, giving it an eye-soothing touch of sportiness and luxury. Having a look at the cabin you’ll find a 7.7 inch high resolution LED touchscreen with ‘Volkswagen Sideways’. A built in house application that allows you to look for type and numbers of places (restaurants around). Volkswagen Beetle Dune Concept is dipped in sportiness and saga begins with sports seats upholstered in Titan Black located in front of three-spoke steering wheel with its vertical spokes dipped in same orange while remaining matches the second color of interior. 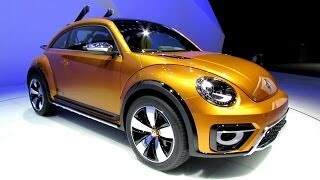 The exterior of Volkswagen Beetle Dune Concept 2014 looks cool, especially with its ‘Arizona’ Orange metallic paint with inserts of black on bottom line running through the body and roof spoiler. The front fascia of Volkswagen Beetle Dune Concept comes with traditional round bug-eyed Bi-xenon headlights while bottom section features a mount (air vents) and eyes (fog lamps). Model gets a new hood which has integrated air vents on it. Moving towards the rear fascia of Volkswagen Beetle Dune Concept you’ll find skis place in spoiler while adding to aerodynamics is a better looking roof spoiler. This entire model walks over 19” five-spoke wheels. 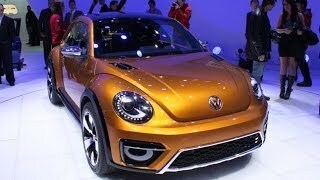 Volkswagen Beetle Dune Concept 2014 brings a 2.0 Liter four-cylinder engine beneath its hood, generating total output of 210 hp and mates to six-speed DSG Dual Clutch automatic transmission sending power to the front wheels of Volkswagen Beetle Dune Concept 2014.